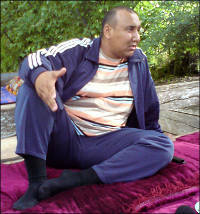 The murder of mafia boss Aibek Mirsidikov became the episode of desperate struggle, taking place in the southern region of Kyrgyzstan between many contenders. The award for winners is power and property. The first official comment on the event was given by acting governor of the Jalal-Abad Oblast Bektur Asanov. The official explained the death of Mirsidikov by "the fights of the criminal world". Three days earlier the General Ismail Isakov had to admit that criminal structures had become more active in southern Kyrgyzstan. This issue was raised by the entrepreneurs, concerned with pressure and expropriation of property in the southern regions. The experience of two previous revolutions says that the shift of political power in Kyrgyzstan inevitably leads to rebalance of power in criminal world, closely tied with politics and business. The mafia bosses continue to play important role, providing services to various political forces. Therefore, the political figures have to "pay bills" on time. The best example of patron-client relations between these two social groups is scandalous story of mafia boss Ryspek Akmatbaev that threatened to bombard the White House if Kurmanbek Bakiev did not meet his requirement. The president had to negotiate the criminal leader, producing public indignation. In the post-revolutionary Bishkek the criminal leaders were so unpunished that human rights advocates and dwellers had to organize the special meeting, demanding the president to end the games with criminals. Allegedly, Akmatbaev was assigned to organize the resignation of Prime-Minister Felix Kulov, not demanded by Bakiev anymore. In exchange Akmatbaev was promised to get rid of all convictions and allowed the access to deputy’s mandate. Due to external factors the plans did not come true while the issue was closed up after the murder of Akmatbaev. The same happened to another Bakiev’s "problem" was Bayaman Erkinbaev. The prominent southern mafia boss and parliament’s deputy, which sponsored anti-Akaev meetings, very soon became the opponent of Kurmanbek Bakiev. The shift in the political position was simply reasoned: the new rulers wanted to have a piece of his property. Some sources report that after the death of Erkinbaev his resources were taken over by president’s brother Akhmat Bakiev that step by step established controlled over all illegal business in the South. After the revolution and departure of Kurmanbek Bakiev all-mighty Akhmat was kidnapped by Bayman Erkinbaev’s teammates, say well-informed sources. They demanded to return the expropriated property. It is not clear yet whether Akhmat was able to resolve this issue. However, the redistribution of wealth, reasoned by the change of political power, is still going on. One of the versions is that current murder of Mirsidikov is the result of fights in the criminal circles. Whatever the reasons are this murder will be given political background; acting governor Asanov already said that "Bakiev’s team lost its criminal leader". For Asanov himself the murder of 36-year old Mirsidikov, "black Aibek", is good news. Allegedly, people, armed by Mirsidikov, attempted to remove Asanov, appointed by interim government. Their attempt to take over the Oblast administration office and appoint "their own" governor failed; one of the reasons was the involvement of Uzbek community, led by Kadyrzhan Batyrov, that discarded the crowd. Batyrov and Mirsidikov are Uzbeks, opposing each other. They are antipodes in the big Uzbek community. Batyrov is a businessman that made big money on legal business and made political career during Akaev’s rule. Mirsidikov is typical representative of the local criminal circles. Batyrov was not able to find the right approach to Bakiev’s regime and lost some of his property. On the other hand, Mirsidikov, properly fitting Bakiev’s system (the integration of official power and illegal business), was gaining power. Therefore, the conflict arose between them after the end of Bakiev’s rule. Batyrov provided the immediate support to interim government. Black Aibek played another game. At first, he blamed Batyrov in the burning the houses of ex-president and his relatives. He perfectly knew what he was doing: the news about burning Kyrgyz houses by Uzbeks produced the big annoyance among Kyrgyz. The anonymous leaders (not typical for Kyrgyzstan) organized the meeting in Jalal-Abad. The crowd devastated the people’s friendship university, founded by Batyrov, demanding to bring him to trial "for inciting of interethnic conflicts". Uzbek factor was introduced in the political game in southern Kyrgyzstan – the situation became very serious. Under some circumstances the struggle for power may bear destructive nature due to inter-ethnic opposition. Negative scenario was demanded only by the supporters of ex-president. Minsk, hosting Bakiev and his family, proposed to send CSTO troops to Kyrgyzstan. It is hard to predict further events – the return of overthrown president with the purpose to rescue the republic, taken over by illegitimate power, not able to control the situation. Twenty years ago, in order to suppress the riots in Osh Oblast, resulted in the massacre of hundreds of Uzbeks and Kyrgyz, the government decided to send troops. There is no doubt that the illusion of Osh tragedy was reminding the members of interim government about the significance of the problem when they were discussing the action plan for 6 hours in a row. The curfew, introduced in Jalal-Abad, demanded interim president status from Roza Otunbaeva and stabilized the situation for certain period. I believe the peaceful tactics, adopted by special representative of the government and general Ismail Isakov, was successful. He met few of the requirements, proposed by meeting leaders, and promised to consider others in the government. He did not detain the meeting leaders although 3 persons were killed and 70 were wounded in the bloody event. Isakov promised to bring Kadyrzhan Batyrov to trial; however, Batyrov is still not arrested. What did Batyrov do, being blamed in inciting of interethnic conflicts? The interim government and Roza Otunbaeva blamed Bakiev’s people, but not Batyrov, in the organization of interethnic opposition. Obviously, the interim government did not change its attitude towards the leader of Uzbek community in Jalal-Abad, but it did not want to publicly protect him either. The relations between two ethnic groups are not easy. On one hand, there are many interethnic marriages. The separatist mood, present at the beginning of 1990s, disappeared thanks to policy of Askar Akaev and the slogan "Kyrgyzstan is our common house". Nonetheless, we do not see the nation, unified by civic identity. Generally tolerant Kyrgyz are very perceptible for any ethnic independence trends, especially from Uzbek community, the second biggest ethnic group in the republic. Various sources say there are up to one million Uzbeks in Kyrgyzstan; this is quite significant amount for the republic with total population of little over 5 million people. Batyrov’s proposal to include in the draft Constitution the official status of Uzbek language in the areas, populated by ethnic Uzbeks as well as appeal for Uzbeks to get involved in politics and defend their civil rights were very brave both for Uzbeks, traditionally distanced from political battles, and Kyrgyz, accepting any signs of ethnic minority self-support as the threat for titular nation’s rights. The riot leaders properly used common discontent in order to force the interim government to get rid of people, able to oppose. All these games were controlled in Bishkek. Being advised by the rulers in Bishkek, Kadyrzhan Batyrov sent video message via local TV channel where he brought apologizes to Kyrgyz people for some statements. This significantly cooled down Kyrgyz. After Isakov said that "the measures on conflict prevention in the south produced positive outcome" and "people feel that the republic is led by the government" the interim government faced the counter strike. Former emergency Minister Kamchibek Tashiev demanded the government to fulfill the requirements, set at the meeting in Jalal-Abad: to shut down the people’s friendship university, founded by Kadyrzhan Batyrov, bring Batyrov to trial and remove acting governor Asanov. The ultimatum deadline is June 7. Otherwise, he promised to bring new squads (i.e. milit0061nts). Curiously enough, Black Aibek, the key player in the recent turmoil, was killed on June 7. It is interesting to note that Ata-Jurt (Motherland) party, including Tashiev, held the session on June 7 where the members criticized Batyrov, but mentioned nothing about the ultimatum and meetings. This does not mean the struggle for power in the South is over. In the opinion of Valentina Gritsenko, the representative of Spravedlivost human rights center in Jalal-Abad, the interim government does not possess full information about the events in the oblast. "The provocative conflicts in the small villages produce interethnic clashes – she told Bishkek press-club. – The provocative nature may cause the long term problems". At the moment, Gritsenko underlined, "it is necessary to take measures to improve interethnic relations. And it is also necessary to work with common people, but not leaders". Will civil society representatives be heard? The truth is that they have no one to rely on, but themselves. The referendum and elections are coming up soon; this means we can expect new redistribution of wealth and power throughout the republic. The South and its problems will remain the most vulnerable part.